Hadara Lazar is an Israeli novelist and journalist, who has occasionally turned her hand to historical non-fiction. In 1990 she published a book in Hebrew made up of interviews with Jewish, British, and Arab people who had lived in Palestine in the final years of the British mandate. This book has now been translated in English under the title Out of Palestine: the making of modern Israel, though its original Hebrew title (The Mandatorians: The Land of Israel 1940–1948) probably gives a more accurate idea of what the book is about. Avishai Margalit, emeritus professor of philosophy at the Hebrew University of Jerusalem, was a child in Jerusalem in those years, and he’s just published a thoughtful article in the New York Review of Books that’s partly a review of Lazar’s book and partly an assessment of the whole British mandate period, informed by his own childhood memories. You can read it here. He concludes that the mandate itself was “relatively speaking, a pretty benign system of rule”—though that doesn’t mean he lets anyone of the hook for the situation it created. Coincidentally, at around the same time as the English translation of the first book belatedly appeared, Hadara Lazar published another history book on the same subject in Hebrew, Shisha Yechidim [Six Singular Individuals]. This is made up of portraits of six individuals who were active in Palestine in the years of the mandate, two of them Arabs, two British, and two Jews. Not speaking or reading Hebrew, I’ll have to wait for an English translation (hopefully not twenty years this time), but in the meantime there’s a short review of both books by Itamar Rabinovich, professor of Middle Eastern history at Tel Aviv University. 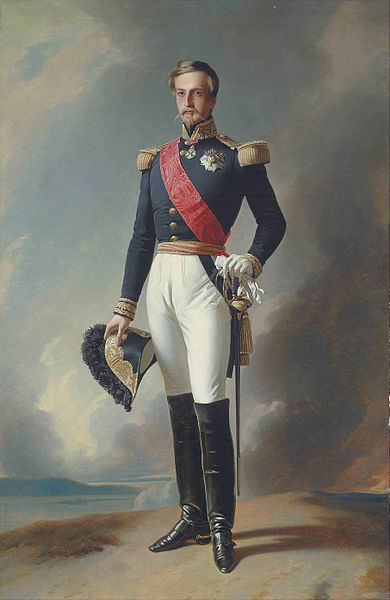 As my right honourable friend sets forth on his pacific mission to Algeria, will he, with his great historical knowledge, bear in mind that when Louis Philippe sent his eldest son to Algeria in the 1840s on a similar venture, it took a century, massive casualties, the overthrow of the Third Republic and the genius of General de Gaulle to get the French army back out of the north African desert? At this time the French ‘pacification’ (ie, conquest) of the territory had run into trouble, in the shape of concerted resistance led by the Emir ‘Abd al-Qadir. Henri was one of the leaders of the French army that spent a decade or so being run ragged by the emir, but eventually ground his forces down to an armed surrender. Did Peter Tapsell really want to compare David Cameron’s trip to Algiers, accompanied by the head of MI6, to a brutal colonial conquest? I’m not sure if this is how the prime minister would like any British military involvement in Algeria to be presented, especially as it would rely on Britain’s close security cooperation with the Algerian government. The end of l’Algérie française did lead to the downfall of a republic, but not the one Sir Peter mentions. The Fourth Republic, set up after the liberation of France, was overthrown (if that’s the word) in 1958, as a direct result of the Algerian war. General de Gaulle, called back to power after a near military coup launched by army officers in Algeria, ditched the parliamentary constitution of the Fourth Republic and got it replaced by the far more presidential, rather less democratic, but stable constitution of the Fifth, which is still with us. But it was another few years before his ‘genius’ finally accepted Algerian independence. (Recommended reading on what this meant for France: Todd Shepard’s The Invention of Decolonization.) 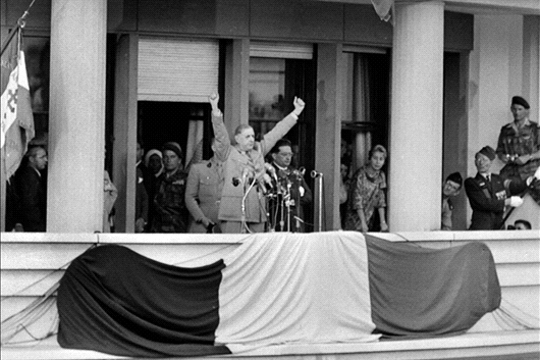 Here he is in Algiers in 1958, telling the crowd of European settlers “Je vous ai compris!”: they thought he meant that he was going to fight to keep Algeria French, and at that point he probably did. 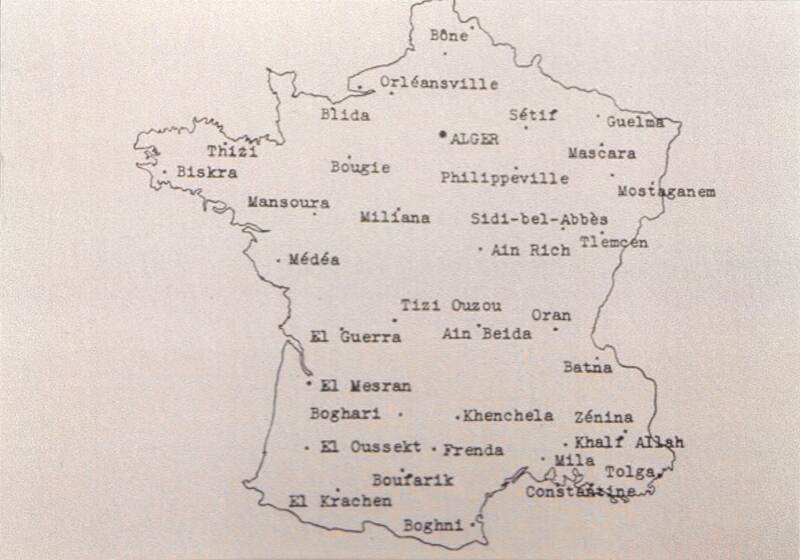 I can reassure my right honourable friend that I am planning only to visit Algiers. I am sure he put down an urgent question at the time of the events to which he referred, and got a response. 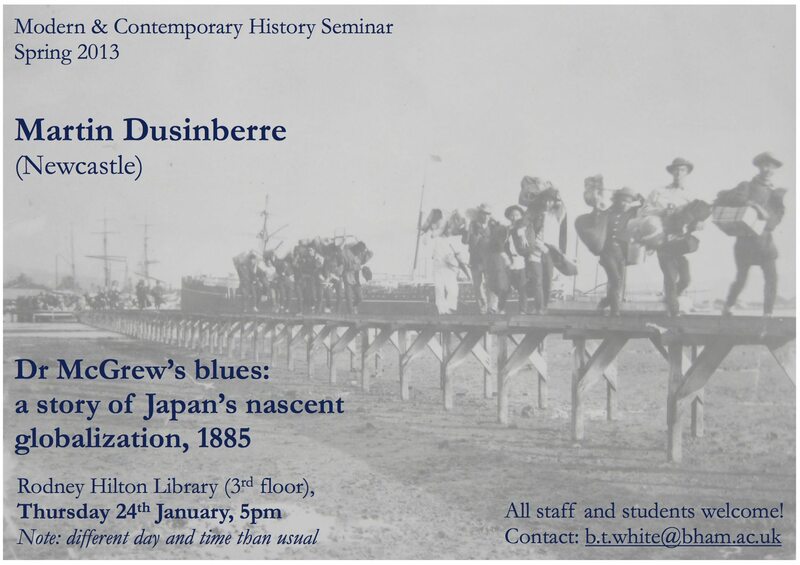 Our seminar speaker this week, in a joint event with the Centre of West African Studies, is David Anderson, professor of African history at the university of Warwick. David is the author of ‘Histories of the Hanged’ and an expert on Britain’s repression of the Mau Mau rebellion in 1950s Kenya. As such, he’s been involved in the current court case against the UK government by Kenyans who were tortured by British forces—a case which has resulted in the government being forced to admit the existence of incriminating archives it claimed had been lost or destroyed. The seminar is entitled ‘The rule of fear: state violence in colonial Kenya, 1952–55’: 4.15pm, Wednesday, in the Rodney Hilton library as usual (Arts building, 3rd floor). David is also running a discussion session for postgraduates beforehand, 3–4pm in the Styles room—next to the Rodney Hilton library—about the question of archives being lost, destroyed, or hidden: ‘Guilty secrets and historical enquiry’. 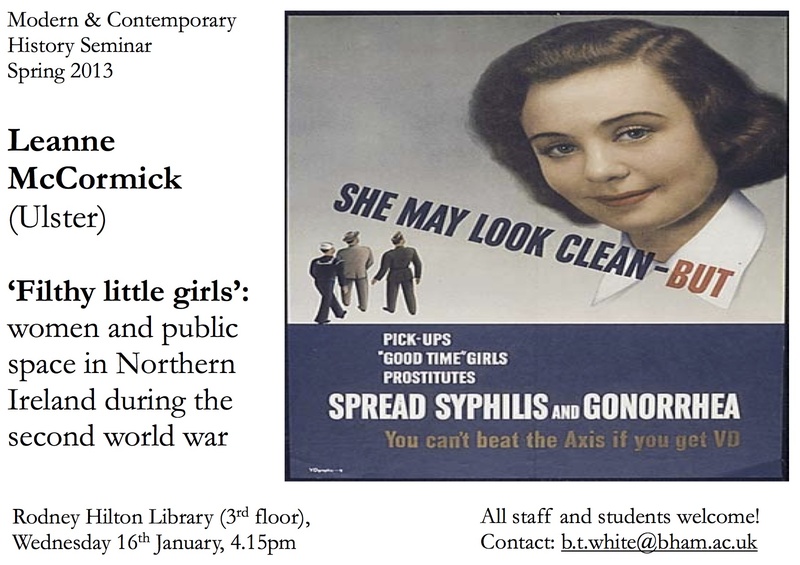 Please email Dr White if you’d like to come: b.t.white@bham.ac.uk. Attendance is open but we’d like to keep track of numbers. Finally, a quick announcement about an event elsewhere in the university that may be of interest: the History of Medicine seminar, in room WF38 of the Medical School on Thursday 31 January at 5.30pm. The title is ‘Soaking up the rays: visual and material cultures of British light therapeutics, c.1899-1938’, and the speaker is Tania Woloshyn (also from Warwick, as it happens). 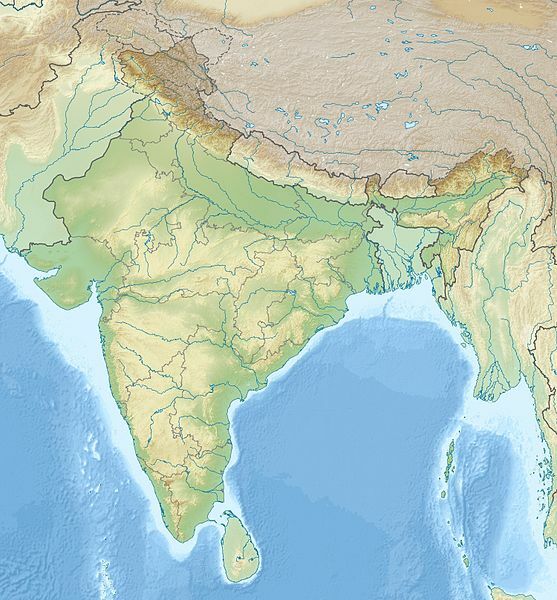 One of the most interesting and provocative things I read last year was a brief political history of modern India by Perry Anderson, published as three long essays in the London Review of Books. Sharply written and with an iconoclastic view of the successes and failures of Indian nationalism from the late colonial period to the present, the essays are a bracing introduction to the subject for specialists and non-specialists alike—they’ll certainly help you understand what’s going on when you listen to news from the country today. As a historian of a different part of the world, I found the essays full of useful insights and ideas: a fine comparative perspective to help me understand my own subject. Having read the first essay when it came out, I wasn’t surprised to see a note from the editors of the LRB under the second saying that they’d started to receive letters in response and ‘expected to receive many more’. A batch of them were published after the third and final essay had come out; on the website, they’re now visible under each essay, but it’s worth waiting until you’ve read all three before you move onto the letters. Anderson’s response to the letters—most of which were critical, predictably and unpredictably—can be found here. Update: there’s also some informed comment on this subject from James McDougall, an Algeria specialist at Oxford, here. Hugh Roberts, a former North Africa programme director for the International Crisis Group who now teaches at Tufts University in Boston, asks some questions about the stand-off here. The visit of the Tour de France 2014 to England has made lots of people very excited again this week, as details of which towns the yellow jersey and his entourage will visit have been announced. Very sadly, Birmingham isn’t one of those lucky towns, but that doesn’t mean there’s nothing for us to find interesting in the history of cycling. 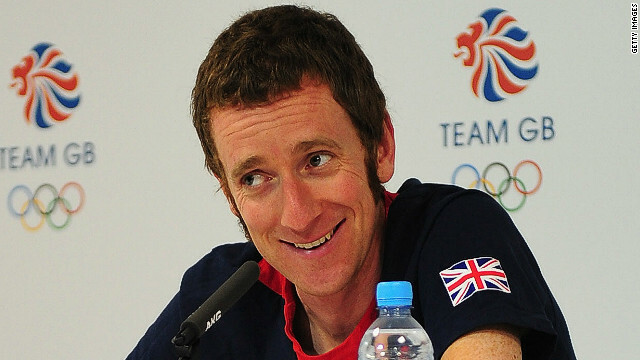 Sideburns and cycling: is Wiggo the nineteenth century incarnate? 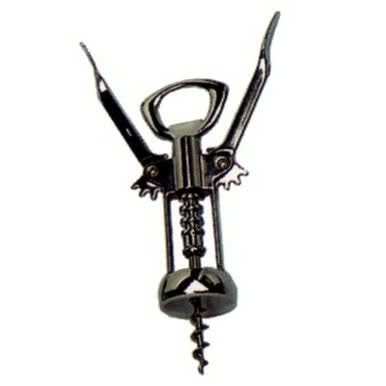 Click picture for image source. You may think that Bradley Wiggins’ spectacular sideburns have something of the nineteenth century about them, and it’s no surprise that histories of the bicycle start in this period, with its (alleged) invention in Glasgow in 1839 (thanks, Wikipedia). But the bicycle has inspired conflict too. The sport’s UK governing body, the British Cycling Federation, characterises late nineteenth-century resistance to road racing in terms akin to class warfare: the wealthy hated the thought of incursions into their beloved countryside by the working class pleasure-seekers racing noisily through the land on two wheels. There have been attempts, too, to big up women’s role in competitive cycling. Claire Simpson’s chapter ‘Capitalising on Curiosity: Women’s Professional Cycle Racing in the Late-Nineteenth Century’ begins with an account of how, in 1896, ‘…Mr Ritchie’s exhibition of ladies’ cycle races ‘proved one of the most powerful attractions we ever had. And besides its numbers the crowd that came to witness the contests was … the most aristocratic of any that has ever entered our building’ (How Ladies’ Cycle Races are Managed, 1896, 221)…’ (Cycling and Society, p. 47). Cycling and car use in Great Britain, 1952 to 1999. Click graph for image source. However, perhaps the greatest tension in the two-wheeled sport is between those who do and those who don’t. This graph, from D. Lawlor et al’s 2002 article, shows a downhill race in kilometres cycled per year between 1952 and 1999. It’ll take a whole lot more than bushy sideburns to remedy that. Here’s the announcement for our week 2 seminar, given by Leanne McCormick, who works on the sort of subject you can’t tell your mum and dad about. One of the great pleasures of being a professional historian is snarking at the mistakes in discussing the problematic aspects of historical films. At the University of Texas’s excellent history site Not Even Past, they have a whole page dedicated to it, with recent posts on Django Unchained and Argo among many others. Elsewhere on the internet, the new film of Les Misérables is generating some thoughtful comment: there’s a good piece on Foreign Affairs about the film’s pessimistic vision of revolution, which Victor Hugo wouldn’t have shared, and a shorter piece at the Historical Fiction eBooks blog which will help you explain to your non-historian friends that Les Mis may be about a French revolution, but it’s not about the French revolution. We may have to start doing some posts like this ourselves. 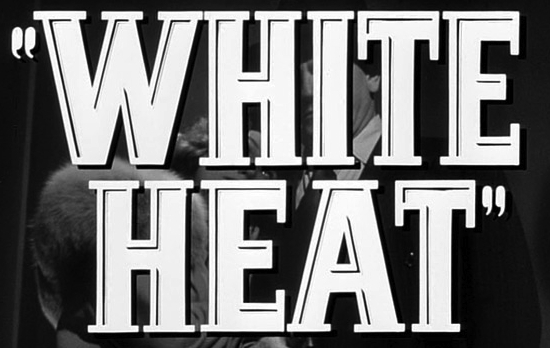 Our colleague Matthew Francis is involved in a conference taking place at the People’s History Museum later in the year to mark the fiftieth anniversary of Harold Wilson’s speech about the ‘white heat‘ of technology—his first speech as Labour leader, the year before he led the party to victory in the 1964 general elections. You can read more about the conference, including a call for papers, here.